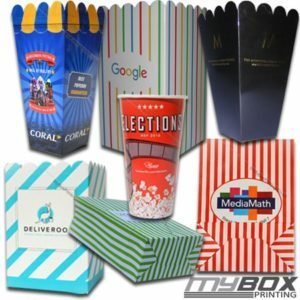 My Box Printing is trusted by major corporations in UK whenever they require personalised popcorn boxes for their parties or events. We have provided ultra quality popcorn boxes to almost every major name in UK. Be sure to check our portfolio page to get better insight. Below are some highlights of the popcorn boxes that we made for our clients. Size: We can make popcorn boxes in mini, small, medium, large or any custom size. Design: You don’t have to worry about the design when you order your boxes with us. We have made boxes with scalloped or plain edges and traditional or crash lock bottoms. Material: We have made popcorn boxes with ultra quality printing materials. You can choose either cardboard, corrugated, kraft paper, art card, silk card or even can demand poly paper cups. Lamination: All our boxes are finished with matte or gloss lamination upon client’s choice. Eco Friendly: All our boxes are made with eco-friendly and biodegradable material to ensure that no harm is done to nature before and after manufacturing. Quick Order & Delivery: And last but not least, our fastest ordering system and quick turn around is one of many reason why our customers trust us with their packaging needs. So if you want to place an order or request a quote, contact us with your box specifications and our sales staff will be in touch. Discount Update: We have announced 10% discount on our custom popcorn boxes and if you want to avail this offer and make sure to receive your boxes before Christmas, we encourage you to request a price quote now. Home » Blog » What is So Special About Our Popcorn Boxes?